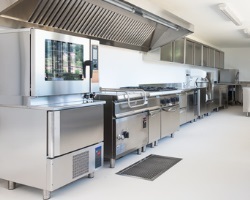 Revolution can provide a reactive and planned hygiene services for your premises. Our team is trained to provide a clean and hygienic finish to all catering surfaces and we can steam clean your flooring to ensure a safe, grease free result. Our team is trained to Level 3 Food Hygiene and we can advise on EHO guidelines so that you are prepared before any official visits. Our planned maintenance service gives you the choice of weekly, monthly or quarterly service intervals so that the heavy jobs are taken care of, professionally. Call Revolution Support Services today to discuss your kitchen cleaning requirements.